Before bedtime on that very first night, Jon was in the dining room changing out a burned out bulb in order to please the 22 month old boy who loved lights. Even now, three months into this foster parenting gig, our family’s favorite two year old is still fascinated with light. 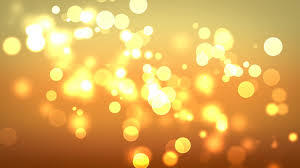 Christmas is a season of light. It seems that everywhere you look, trees and houses are lit up with hundreds upon hundreds of tiny, twinkling lights. Trees glittering through window panes. Colored lights outlining rooftops while white lights make the bushes sparkle. At Christmas, there is nothing more lovely than a tree lit up with lots of lights. Normally, I relish in decorating our family’s Christmas tree. I love to cover it in lots and lots of lights, and then fill it from top to bottom with hundreds of ornaments. Finally, I wrap the entire tree is sparkly gold ribbon before adding our star to the very top. Yet, as much as I love the process and result of tree decorating, this year I decided NOT to decorate a tree. It wasn’t easy to come to such a conclusion, but after a two hour attempt to keep our two toddlers from completely destroying my mother’s Christmas tree, … well, I realized it would not be a fun Christmas season if I had to spend every waking moment trying to keep myself between the tree and the toddlers. At first, I tried to come up with a solution that would still enable me to have my cake and eat it too … or, rather in this case, have my tree and decorate it too. Someone suggested surrounding the tree with baby gates. I considered it, but then realized it would cost me a small fortune for something I really didn’t want to have after Christmas. I also contemplated putting the tree up in a more out of the way location in our house. However, our home has a relatively open floor plan. The only out of the way locations available were bedrooms, bathrooms and Jon’s home office. None of those options felt like a good place to put the family Christmas tree. In the end, it seemed as if there were only two options. Put up a Christmas tree and then spend the entire season constantly guarding it from an attack launched by two small children. 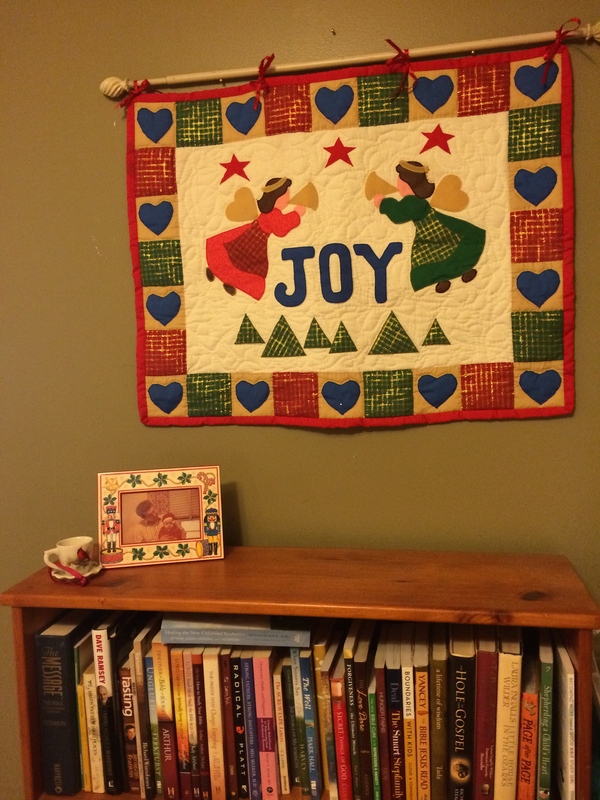 Or forego the Christmas tree this year and find other ways to decorate our home. But if I thought I was disappointed about having a year with no Christmas tree, I should realized the magnitude of the reaction I was about to get from my five teens and tweens. When I first broke the news, a few took the news rather well, but there were a couple that stared at me in stunned silence before beginning to beg and plead with me to change my mind. When I wouldn’t, I received several glares that could kill had there be any super powers involved. Fortunately for me, I am raising humans and not super heroes. My kids are fortunate too, for I am not a mean old Grinch … though they might occasionally beg to differ with me on that point. Still, I never intended NOT to decorate our home for the Christmas season. I just determined that a typical Christmas tree should not be part of this year’s holiday decor. So instead of focusing on my tree, I decorated the doorways with garlands and decked out the walls. 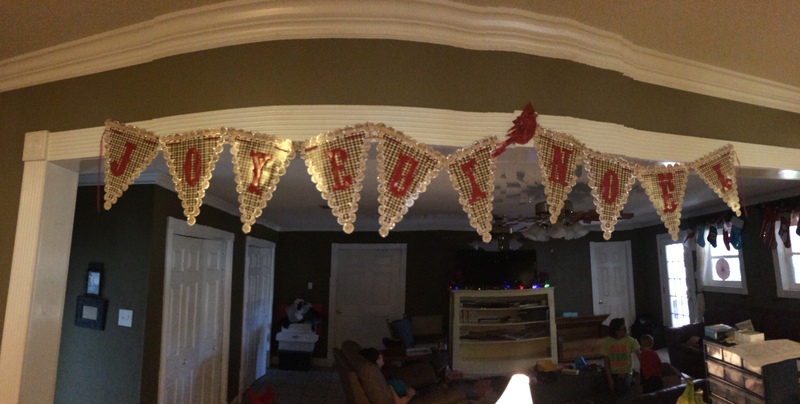 My banner that drapes across the kitchen. It says “Joyeux Noel.” I figure consider I that I live in the heart of Louisiana’s Cajun Country, I at least ought to include a little French in our Christmas decor. 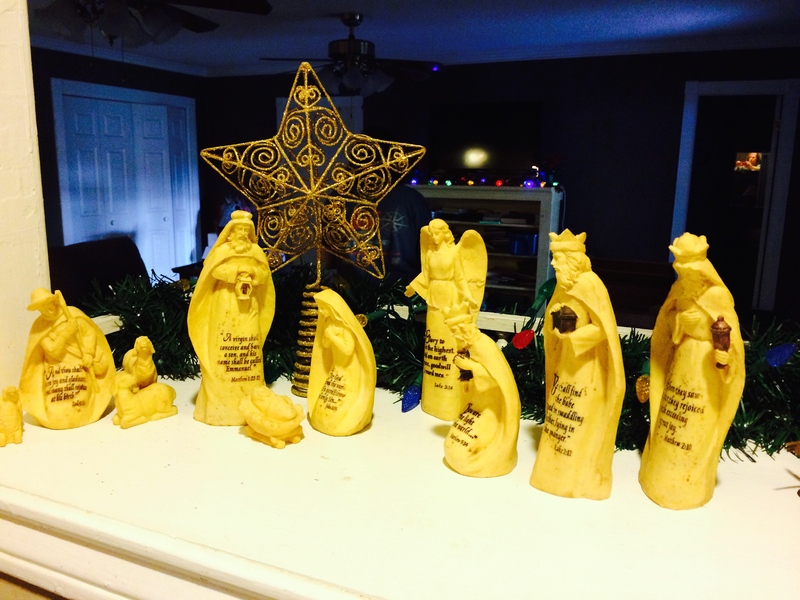 I set up displays of nativity sets on every solid surface out of reach of little fat fingers. 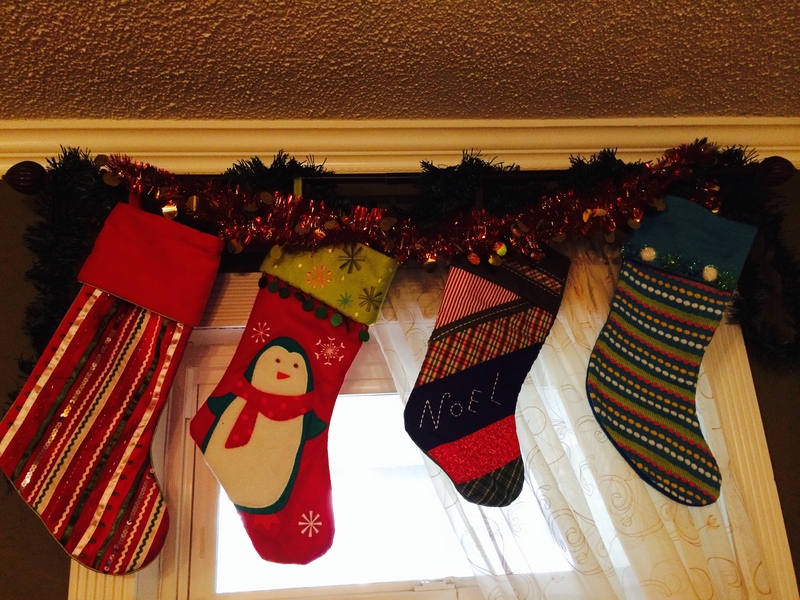 The stockings were even hung. Not over a chimney, which we don’t have anyway, or in their usual place along the living room shelves. 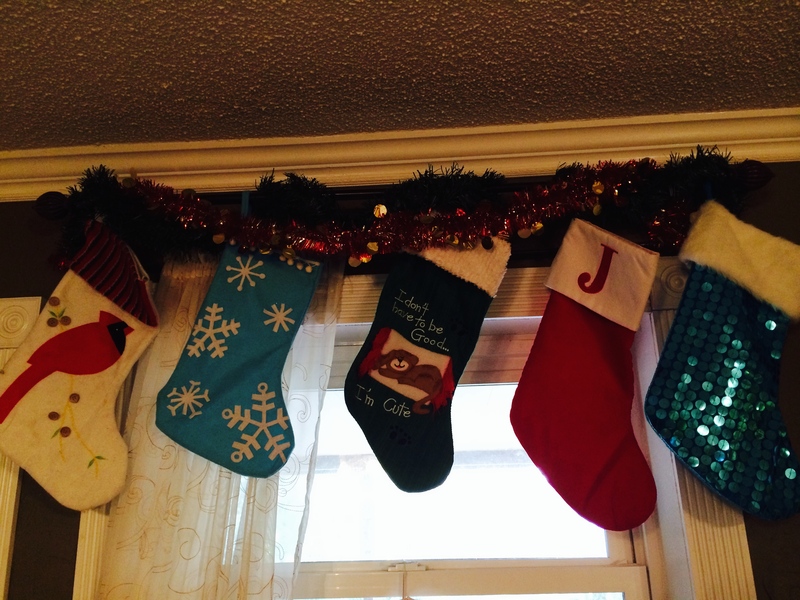 Rather, the stockings found a place to hang over the living room windows. I liked the way they looked, nine stockings hanging in a row. In the end, there was tree to decorate after all. Last weekend, I found a mini-tree on sale for less than $10, so I got it to put on the ledge above the kitchen sink. 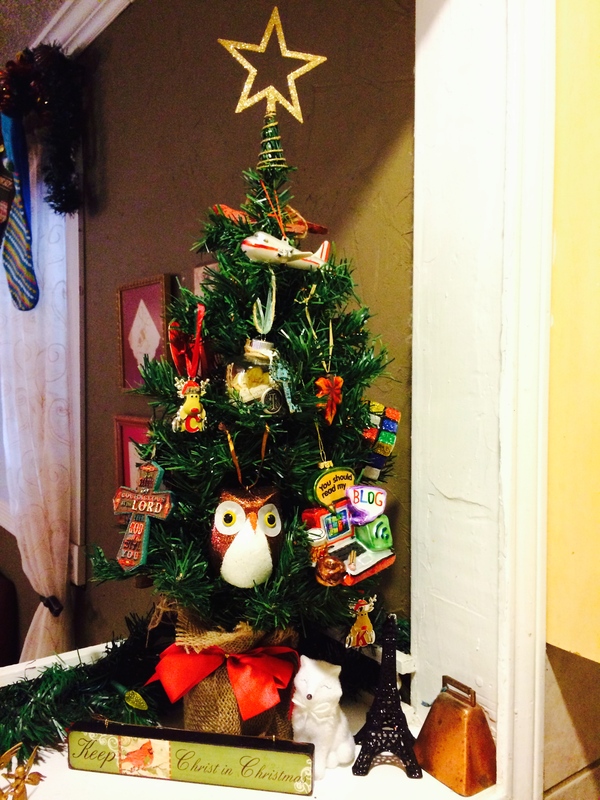 It just so happens that it can be seen from the living room as well, which makes this small tree the perfect place to display each person’s new ornament for 2014. (1) Eiffel Tower for Julia who has been collecting them since her summer trip to Paris; (2) A plane for Joel to remind him of his first trip overseas; (3) A Rubik’s cub for Nate who figured out the key to solving them; (4) A sparkly owl for Meg; (5) A glittery snow fox for Maddie; (6) Two reindeer with the initials K and C for the foster babies; (7) a turquoise and brown cross for Jon; (8) and a cow bell which represents my wedding anniversary to Jon … it was tied to the back of our getaway car at our wedding which will be 4 years ago on Dec. 31st. But my favorite ornament on this year’s tiny tree is the one I bought just for me! While I take all the credit for decorating the inside of our home, Jon always takes care of making the outside look merry and bright. 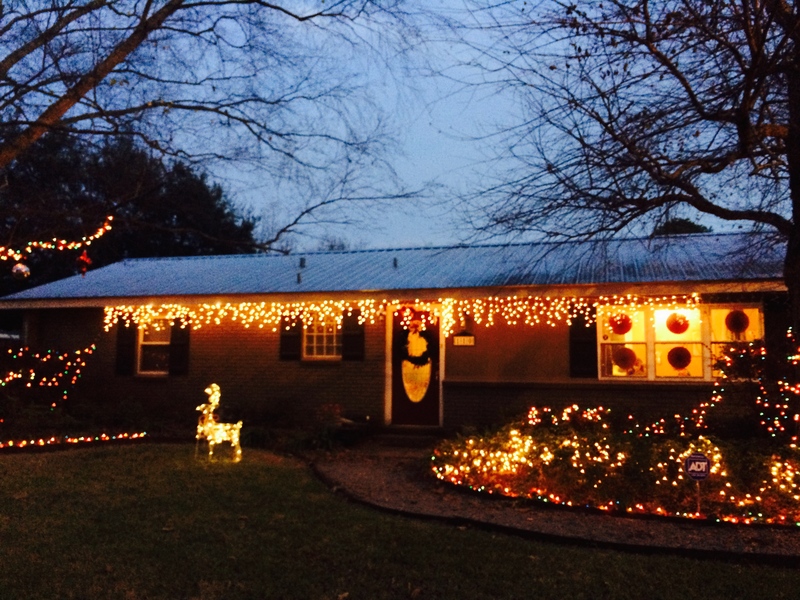 This year Megan helped decorate the front yard, stringing lights all around and placing a simple reindeer on the front lawn. As always, they did a fantastic job! But even though I loved the welcoming look, what I really wished was that we had a little extra money to buy a wreath to hang on the front door. (True fact: When you have seven kids, there is never any extra money.) 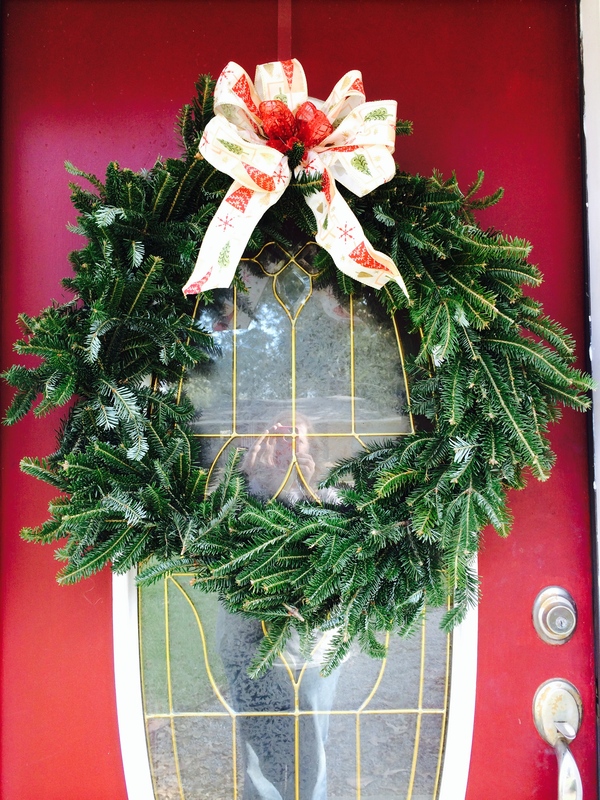 Imagine my surprise when the very next day my sweet friend Korin gave me a beautiful fresh wreath that she made just for me to hang on my front door. 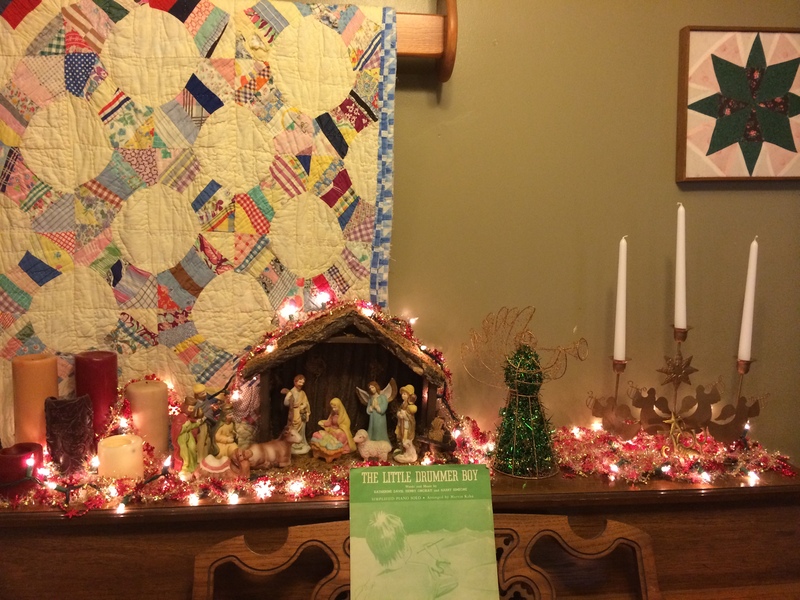 We may not have a tree this year, but the signs of Christmas are all around the house, and I am praying daily for signs of Christmas growing in our hearts as well … the Christmas spirit of generosity and of love and of humble worship. Three months ago a tiny little boy and his baby sister came to live with us. And from the very beginning, the lights in our home fascinated him. This Christmas, we have a blessed opportunity to share the wonders of the season with two innocent children. It may be the only chance we have to share Christmas with them. So we will drive that sweet boy up and down the streets after dark, showing him the city all lit up for Christmas. We will bake cookies and open gifts and bask in the glow of Christmas excitement. And through it all, I will hold out hope that on some future day these precious kids will see the pictures and know how much fun our family had sharing this Christmas with them. But more than anything else, I pray for our little ones’ hearts to be captivated by the Light of this World, the Holy Infant of Bethlehem who came to save us from our sins. We may not have a big Christmas tree and the presents we open may be relatively few, but oh how I hope even at their tender ages they will see the light of His love living in us, and because of that they will long to know Him more. Because really … that’s what Christmas is all about. Looks like you are having a great Christmas season. Sorry I haven’t been on WP for the past 2 weeks. I’m in NYC and have been for several days. Enjoy!!! Thank you dear girl. It is nice here at Christmas time. But sooooo many tourist. Your house looks beautiful! I love your many nativities .Funny- I used the same verse you did today and talked about the Light of the world today in my gloomy, gray for way too long post!! 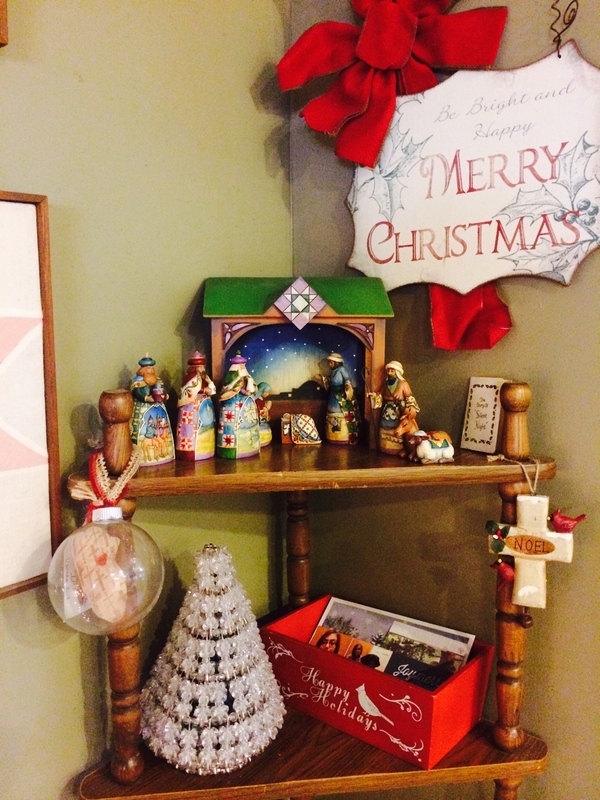 Can you believe I didn’t even put out a couple of nativities I own?! I never intended on having quite so many, but somehow I have gathered a rather large collection of them. And about that verse we both used on the same day … that happened because great minds think alike, obviously! LOL! I enjoyed this one a lot dear! You’ve all done a great job – the entire place looks so festive! 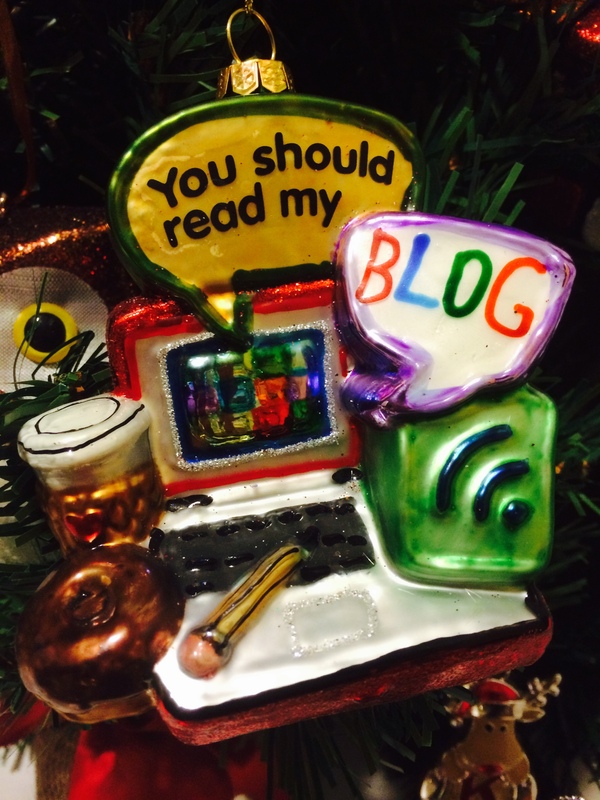 I especially love the miniature tree with the blogging ornaments! Do you have to make me cry at work… at 9AM??? ?